As to what the seal itself means, the Pipe is featured on the seal superimposed over the design as to say, “always respect the sacred pipe,” which represents our religion, given to our ancestors by Wa-Kon-da where only his forearms were seen when he gave the sacred pipe to our people. The seven feathers are a later addition to the pipe somewhere in the 1970's and that would mean a feather represents each of our seven clans. The next element in the design are three teepees, this is where several interpretations begin. Mainly that the teepees represent three traditional groups of leadership in our ancient order, one teepee for the Chiefs, one for the Warriors (Hethuska) and one for the Medicine leaders. Each teepee represents a separate branch of Ponca Government, three branches of equal authority representing the separation of powers. Another interpretation of the three teepees represent the teaching of our people: to love one another, to help one another, and depend on one another. Lastly, this interpretation of the three teepees comes directly from a Ponca Elder who stated the three teepees recognized the last three villages in Nebraska, when the Poncas resided there, which consisted of: Grey Blanket Village, Scary Village, and Fish Smell Village (All of which have corresponding Ponca words). Another element of the great seal is the Sun. If Mars was asked to add the first two elements of the seal i.e. the pipe and teepees. Most likely, the third element; the Sun was entirely his own addition. If you study Mars's art style, his addition of the Sun is certainly in a good many of his works. 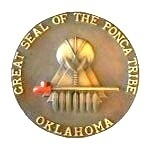 Its use in the Great Ponca Seal ties the other elements together very effectively. It could possibly represent the Ponca Sun Dance but not known, as the Sun Dance was deliberately stopped by the leaders of the Sun Dance after holding what they called the final Sun Dance near Marland, Ok. in the late 1800's. 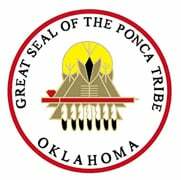 Over all it is a beautiful design, meaningful and serves the Ponca people extremely well as it stands with the seals of other nations. Poncas should be proud we all are collectively represented by this powerful symbol the Great Seal of the Ponca Tribe, truly a Mars Masterpiece!